Well, who saw that coming? Who expected an offensive explosion from the often anemic Indiana Pacers offense? I know I didn’t. The Pacers starting five averaged just shy of 38 minutes each and all scored in double digits (yes, even Roy Hibbert scored in double digits). This helped lead The Pacers to a 107-96 win Sunday afternoon over The Miami Heat. History usually dictates that when Dwyane Wade plays well, the Heat win, however, it appears that just Lebron James and Dwyane Wade isn’t enough to beat a Pacers team when firing on all cylinders. With that being said, let us talk about what The Pacers accomplished in Game 1. The Pacers managed an astounding 42.1% shooting from 3-point range. Their regular season average from downtown was only 38.2%. They also only averaged 92.5 points per game during the regular season, so the 107 points they put up in Game 1 was also somewhat of an anomaly. The entire Pacers roster played well, and they do have the size to counteract The Miami Heat’s smaller, more athletic lineup, however, I don’t foresee The Pacers sustaining this level of offensive efficiency. I also don’t believe that Chris Bosh will score only 9 points per game and continue to go 0 for the century from downtown (he went 0-5 from 3-point range in Game 1). The Heat also have a very solid track record when losing the 1st game of a playoff series. In the 2013 playoffs, they lost the 1st game in 2 out of their 3 series (against The Chicago Bulls and The San Antonio Spurs). The Heat went on to sweep the rest of The Bulls series and they went on to beat The Spurs as well to capture their 2nd straight NBA Championship. Today, most people will be overreacting to The Miami Heat’s Game 1 loss, but I, as I’m sure you have already figured out, will not be. As much as I would enjoy The Heat losing in The Eastern Conference Finals, not only for my own personal enjoyment but for the mass hysteria that would cause, I just don’t see it happening. I believe Lebron James (aka the best player on the planet) will put his team on his shoulders, and on Wednesday morning, everyone will be seated (with arms and legs inside the vehicle) securely BACK on The Miami Heat bandwagon. 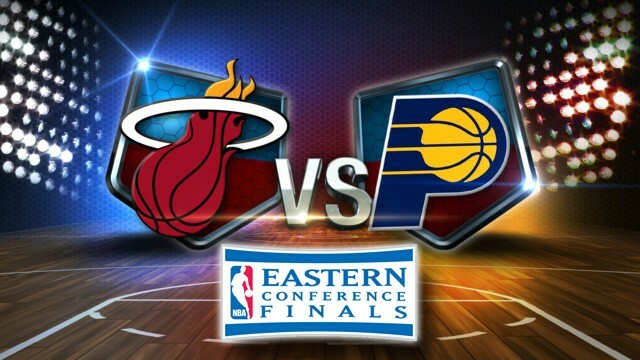 You can catch Game 2 of The Eastern Conference Finals on Tuesday night @ 8:30 P.M. on ESPN. Can’t wait to watch more basketball until then? Then tune into TNT tonight @ 9:00 P.M. to catch The Oklahoma City Thunder take on The San Antonio Spurs in Game 1 of The Western Conference Finals. That should be a highly competitive, fun series to watch as well. Enjoy!